Too much swing. Bouncer is good. Dennis Lillee, Brett Lee, Shoaib Ahktar. Curtly Ambrose, Courtney Walsh, Shoaib Akhtar. Waqar, Shoaib, Wasim. Too much bounce, too much speed. My height is very big, my hair is very big and I have too much style. I copied Shoaib Ahktar: even when I was a small boy I was running 38 steps. Too much hair. Too much style. Height. Hair. Style. Speed, run up, too much six. These are the English words of Shapoor Zadran. He doesn't need these English words. His description is quite evident from his every step. Shapoor could be driving a tuk tuk, hosting the G8 summit or piloting a probe to Mars: the pace, the hair, the style, it would still all be there. It is always there. At the WACA Ground, where he was preparing to unleash himself on Australia, they have a large net dividing the middle of the nets. It is there to stop the balls escaping. But what it does is really curtail Shapoor. He kicks off the net. Like a stallion bucking at a gate. At the nets at Manuka Oval, he had to practice in one of the nets on the right, as the ones on the left were about half a Shapoor run up. For all the talk of Eden Park being small, nothing could illustrate that more than Shapoor kicking off the fence before coming in to bowl. Every single thing in his life is about pace. His kid's haircut is the same as his, and his haircut is the same as Shoaib's. When he was interviewed about bowling, not one of the bowlers he mentioned wasn't a quick bowler. Even his sentences are quick. Shapoor wants to be fast, and look good doing it. Before this tournament he was a man that cricket hipsters knew about. Now he is a bona fide cult hero. He is Eddo Brandes. He is Colin Miller. He is Pakistan cricket. He is pace. He is bounce. He is style. He is Afghanistan. There is not a single thing he does that is not worth watching. The flick of his hair seems designed for nothing more than turning on the whole cricket world. People are obsessed with him. I am obsessed with him. When I found out there were clips of him dancing on YouTube, I watched them. More than once. He was dancing the Attan, and it was absolutely every bit as good as you hoped it would be. I don't watch it because of the religious connotations or cultural importance, but because I truly want to see Shapoor dance. I want to see Shapoor do everything. Shapoor is more than a cult hero, he is a cult. I want to see him hit more match-winning runs, and respond by running as if he invented life itself. I want to see him bowl short balls that slice batsmen in half. I want to see him scream as a catch is missed. I want to see him scream when a wicket is taken. I want to see him play cricket until his run up is quicker than his delivery. I have met most of the greatest modern-day cricketers because of my job. I have never taken a selfie with one. I wanted a selfie with Shapoor. Most of cricket wants one with him. He almost seems too good to be true. Like some film-maker came along and scripted this giant passionate man with style, with hair, with bounce, with pace, to save cricket. At the end of this World Cup, Shapoor will be walking in slow motion to a power ballad while the World Cup blows up behind him and a woman runs over to be in his arms. Sometimes it feels like this happens just on his epic walk back to his mark. And, if it was just Shapoor in this side, that would be enough. But Afghanistan have Hamid Hassan as well. Rocky; Rambo. There are times when it looks as if Hassan is just going through the motions. His run up is not a 12-second ode to joy, it's like listening to a Rolls Royce engine start. It looks as if he is giving no real effort; that he is just jogging in the park. But you can hear the purr, and you can see the blur. Hassan is pace. Too much pace. Too much pace even for Shapoor. When the ball leaves Hassan's hand, people make swooning noises. There was an eight-minute period in the nets at the WACA where Hassan either beat his team-mates' bat or took the edge. Andy Moles, Afghanistan's coach, yelled out: "That's where you live, H". Yes, that is where he lives, in a state of pure liquid awesomeness. Every ball is angled in at the stumps, and then leaves the batsman, it goes sideways, and it goes up. The back net stops it, barely. Without that net, the ball could have just kept going up forever. Later, Moles says: "Bowl there till you're dead." What he really means is, bowl there till everyone else is. In 30 minutes the only shot forward of square is a mis-hit drive that comes to an apologetic stop near his feet. He doesn't bowl a bouncer, he doesn't have to. This is the WACA. It gives him the bounce, the pace; too much of each. He just provides the ball. After terrifying his top order with length balls, Hassan is told to bowl yorkers. Mohammad Nabi, his captain, is batting. Nabi is told by the coaches that all balls to come will be yorkers from now on. 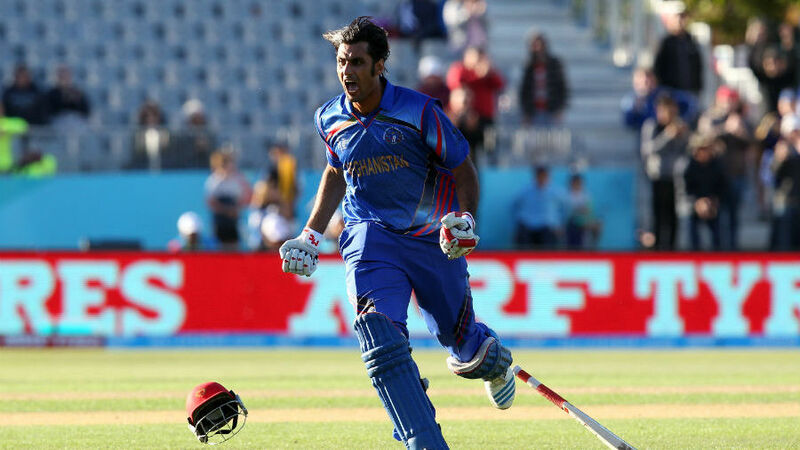 Dawlat Zadran, no slowcoach, bowls a yorker first. Nabi plays it beautifully through cover. The next ball is from Hassan. It starts at leg stump, Nabi opens up, and before his muscle fibres have twitched, his off stump is out of the ground. "H, bowl yorkers" was all the command he needed. Hassan bowled the yorker. And he did it like that. Switched from unplayable length bowling to killer outswinging yorkers. After Hassan took the wicket of Kumar Sangakkara, he cartwheeled. At the Fan Zone park in Dunedin, people watched, people screamed. A few minutes later a kid in a Black Caps shirt tried to do a cartwheel. His inspiration wasn't Rambo, it wasn't Rocky, it wasn't Shoaib, it was Hassan. The WACA has been graced by all the bowlers that Shapoor mentioned. It has had Devon Malcolm, Michael Holding, Joel Garner, Imran Khan, and Jeff Thomson. The WACA is pace. The WACA is bounce. On March 4 the WACA is hosting a couple of blokes from non-Test playing countries. They are pace. They are bounce. They are Afghanistan cricket. They are cricket.